Guns that Aren't: Why do manufacturers hype rifles and shotguns that you can't get? You know what I really dislike? Gun manufacturers who hype guns that don't exist. As soon as a magazine publishes an article about a new gun that isn't in production, the phone calls start and I have to tell my customers the item isn’t available and probably won’t be for 6-12 months. A case in point is Ruger, which announced the P85 9mm handgun three years before I had one in my case. The Ruger Red Label 20 gauge took two years to arrive. 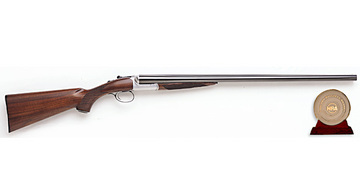 The newest addition, a side by side shotgun, is still scarce a year after its introduction. The irony is I saw one at a shoot I went to in upstate New York a few weeks ago. I asked the guy where he got it and he told me that a friend of his was an oil burner repairman with an FFL who got it from a friend who works at Ruger. How pathetic is that? One of my larger Ruger distributors had five in 2005 and NONE so far in 2006. I’m not sure what the point is of promising what you can’t deliver. While Ruger isn’t the only company that promotes its products this way, it certainly is sending the wrong message. We all appreciate new products, especially if they’re good ones. And most people don’t mind waiting a little while. However, I’ve been doing this a long time, and companies that play this game insult the intelligence of many in their audience. And, they just might outfox themselves when they find their late-coming product upstaged by a more innovative design by another maker. In the computer industry, they call new-but-unavailable products "vaporware." I've been attending SHOT Shows for 25 years and I've noticed that vaporware is not uncommon in our industry. Sometimes it takes several years for production realities to catch up with innovative prototypes. Sometimes it just doesn't happen at all. amen...and the new Remington Cti 105? any bets? Quite common. I remember seeing the Browning A-Bolt was going to made in .284 Winchester. Never happened. The companies introduce new stuff at the SHOT Show and get a few into the hands of select gun scribes and the consumer is left to assume it is available in the marketplace. Aka. Where is the Cimarron Colt Lightning? It's not just the guns themselves. Over the years I've seen several cases of "Oh, you want ammo for that new caliber to?". Remington perfected this approach. This tidbit is both interesting and timely, in that I just received Rugers First Quarter Report for shareholders, in which it states that they will advertise no products which are not yet generally available. I suppose they think that none of their shareholders are gunowners. seems the thing missing here is cheap advertising ! we can make the gun but will it sell all we have to do is show it at the trade show and the responce we get will tell us if its a production worthy gun !if you stock holders are bewildered where does that leave the average joe? ive asked my local cabelas to see a few of these ghost guns they just smile and say havent got one yet!and after all isnt this the first place we see new and improved guns . i guesss i"ll start waiting for the shelf to harbour these ghost guns before i believe their actually in production! I waited more years than I can remember for Olympic Arms to finally release the new Whitney Wolverines. There was a lag of at least 5 years there. It was worth it, though. Right now, it'd be swell if Keltec would actually start distributing the single stack 9mm they've had on their web site for about a year. Products that fail to materialize are not the problem, if the company is going to be unreliable, it's probably better for the consumer that it just doesn't exist. an example would be a bargin basement gun that only lasted on the market for a few years; imagine getting parts ten years down the road. I once had a 22mag made marketed by a company called Ruko thas was on and off the market. The action was built cheeply, and the firing pin actually bent; good luck finding another. I actually had to pay the gunsmith to temper it into something usefull, and sell it as soon as possible. The worst though is, a large company that brings out a new cartridge, and after a few years, pulls the guns, then the cartridges off of the market. If one is a handloader, centerfire isn't too bad; though I would not saavy having a gun that used an oddball case size. Rimfire though, BAD NEWS! Hope you needed that paddle. This subject hit close to home...have been awaiting a Ruger Alaskan since November, 2005. Meanwhile, I have read 3 articles in the gun mags about it. I am about to walk away...not just from the single handgun...from Ruger. This is poor business. before the gun would be available. have them in the catalogs? Thankyou, I thought it was me.I have had horrible luck trying to get guns from Ruger,springfield,smith,etc.Just about every time I call my dealer to try and order a gun I want the answer is UNAVAILABLE.....It seems hopeless. The catalogs are just a collection of lies.